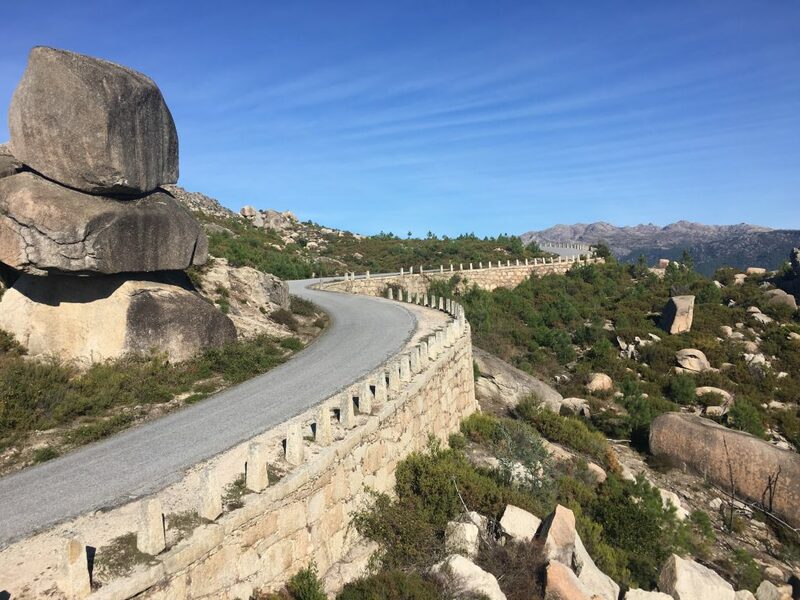 The national park of Peneda-Gerês was a place we fell in love with during our short visit. The first place since we crossed the channel that makes it into our ‘visit again’ list (as opposed to our ‘must visit next time’ list for the sights and places we have passed by). The park is largely forested but above the tree line you’re in a landscape of granite tors and lumpy bumpy ridges. 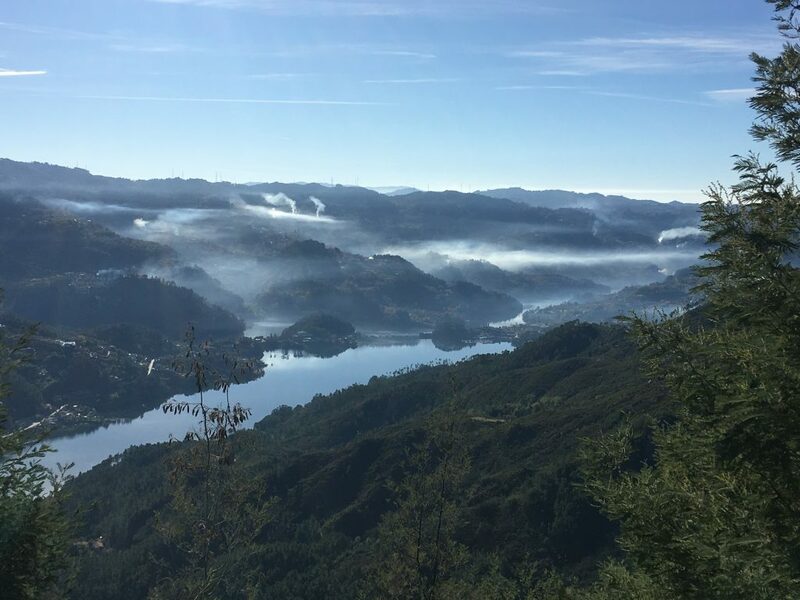 We were lucky with the weather for our visit, at this time of year we should have expected significant rainfall and low cloud, but northern Portugal was getting unusually clear and dry weather for the time of year. Not great for the farmers, especially after the hot summer and awful forest fires, but fantastic for us visitors. We had chosen to base ourselves in the main village, known as Vila do Geres or Caldas do Geres or just Geres, a spa ‘town’ with a string of small hotels and an outdoor pool complex. While we were there most of the hotels were shut and the pools were empty. A few cafes and shops were open but it was very quiet. Our parking place was also the bus stop and the school bus came through a few times each day dropping off a scant handful of children, this area is not heavily populated anyway and according to the internet the population tends to be female and elderly rather than families. To our surprise we weren’t the only motorhome in the car park, another motorhome was already there when we arrived and one British van turned up while we were on our walk, so obviously a few people were thinking the same way as us and enjoying the good weather while it lasted. With clear days came cool nights and we were in double duvet territory (we have a 4.5 tog and a 7 tog duvet, plus blankets and brushed cotton (ok, flannelette) bedding for a bit of extra comfort – if it gets really cold we might wear pyjamas but generally we prefer to sleep in the buff) but the heating didn’t need to come on yet. For our first day in the mountains we followed one of the marked paths on the east side of the village, we picked it up by walking up the first switchback on the road above the car park until we found the red and yellow markers which led us steeply up a track through the forest – our legs complained at this unusual activity, we haven’t done any serious mountain walking since Scotland. Eventually the forest started to clear and we found ourselves in a mountain meadow where people had created many stacks of balanced rocks on top of the granite. From here the path followed the contours of the ridge heading south. We looked at the ridges above us and hankered to climb them, but without maps we didn’t want to head off the route. 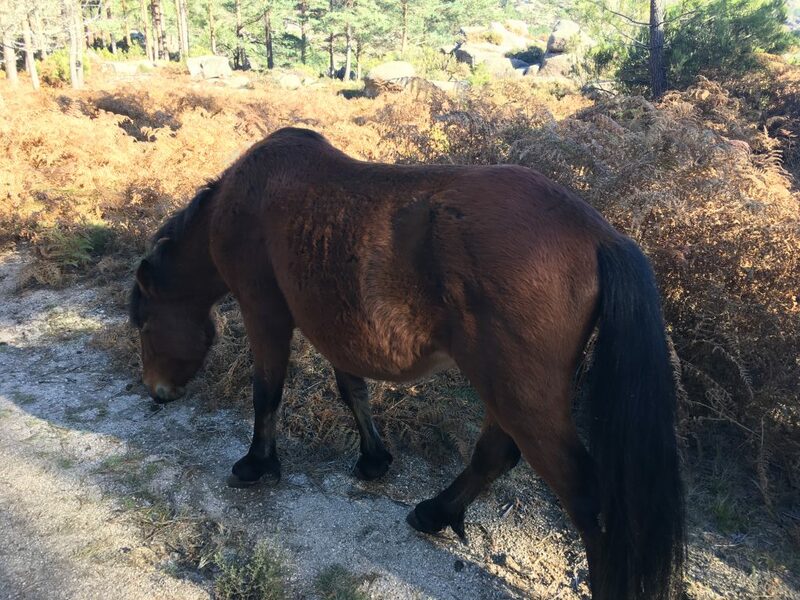 As we started to descend we found the source of the horse droppings we’d encountered on the trail, a few of the semi-wild Garrano horses in the park were munching on the autumn bracken. They weren’t disposed to pay us any attention or pose for photos. 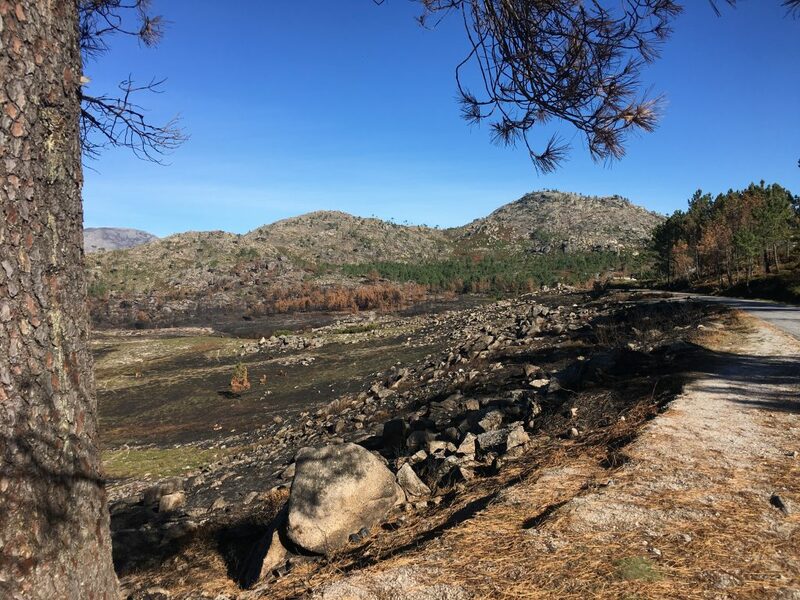 The path headed past an area that was fenced off (we don’t know why) and another mystery area with a cistern of water and large bare patches – we wondered if it was in some way linked to fire fighting. Further downhill at the Miradouro Pedra Bela we surprised a herd of goats off the viewpoints and sent them leaping with bells clanging further down into the valley. There were roads up to the Miradouro but, just like the rest of the walk, we didn’t see anyone as we followed the path, crisscrossing the road heading downhill. The path bought us steeply down to the bottom end of the village and then through the cobbled back street past homes and smallholdings and yapping dogs until it dropped us back down to the car park. On the way we had talked about our plans and decided we should stay another day and make the most of the beautiful scenery and ideal outdoor activity climate – clear and sunny but not too warm – so we had a quick walk down to the bakery to pick up some rolls for the next day’s packed lunch. The following day we got our bikes out to cycle up the other side of the valley – this was the route that the sat nav had tried to bring us down and we were intrigued to find out whether we had made the right decision to turn around. It was a steady climb up the road past the football pitch, we put our bikes into a low gear and chugged along, sometimes it’s easier to keep climbing steadily than it is to cycle through undulating territory where the uphill stretches take your legs by surprise. 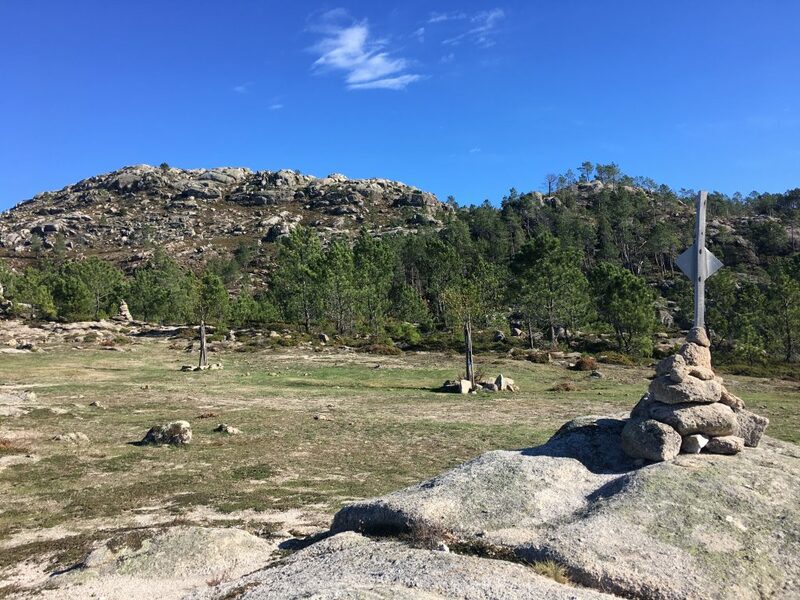 After 500m and 7 km (I am trying to retrain my brain to using the decimal system only) we had reached the highest point of the road, past a couple of picnic spots and viewpoints. 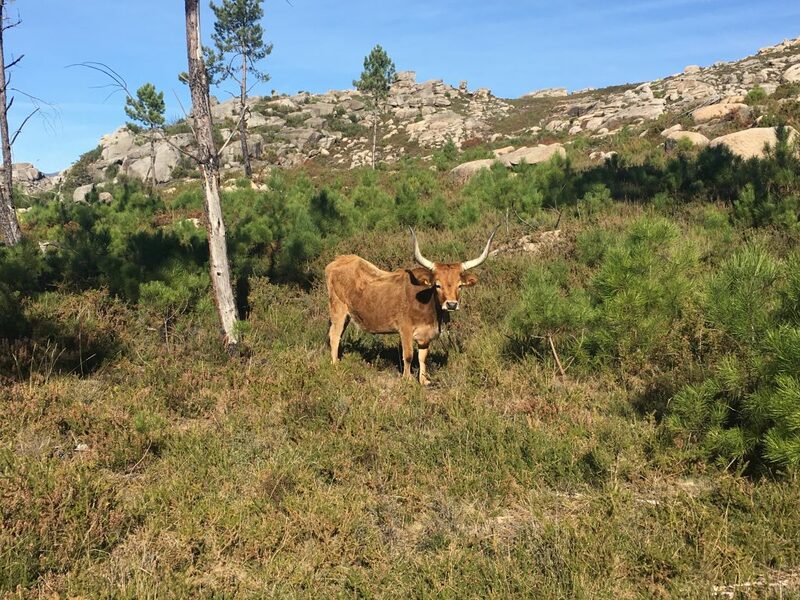 We had seen the first evidence of Portugal’s forest fires as well as a herd of attractive cattle with very sharp horns. The road was actually in good condition and would have been ok to drive in Bertie so long as we hadn’t encountered something coming in the other direction. It wasn’t empty, a dozen or so cars and small vans drove past us as we cycled. Driving in Scotland has spoiled us, we are used to well signposted passing places on single track roads and here the opportunities to avoid oncoming vehicles were few, we were still happy that we’d turned around. Invigorated by our uphill ride we then decided to go further up and take the off road track to the Miradouro da Boneca. This was a different experience as we slogged – generally uphill but with many ups and downs along the way – over rutted tracks to the viewpoint. At the end we had a spectacular view down into the valley and Bertie’s car park, and had the company of other people! 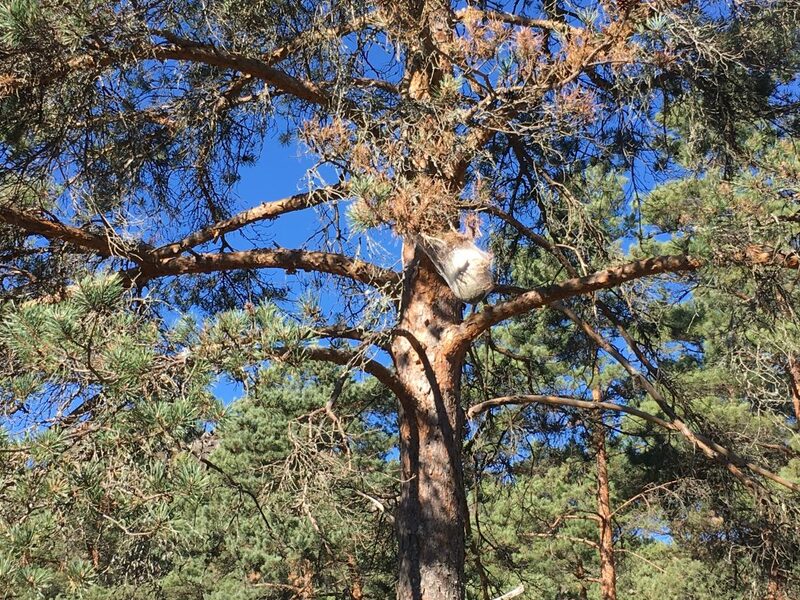 We were a stone’s throw from our starting point and had nearly closed the circle, but I knew there was no way I would cycle the steep path straight down – it would have been suicidal. 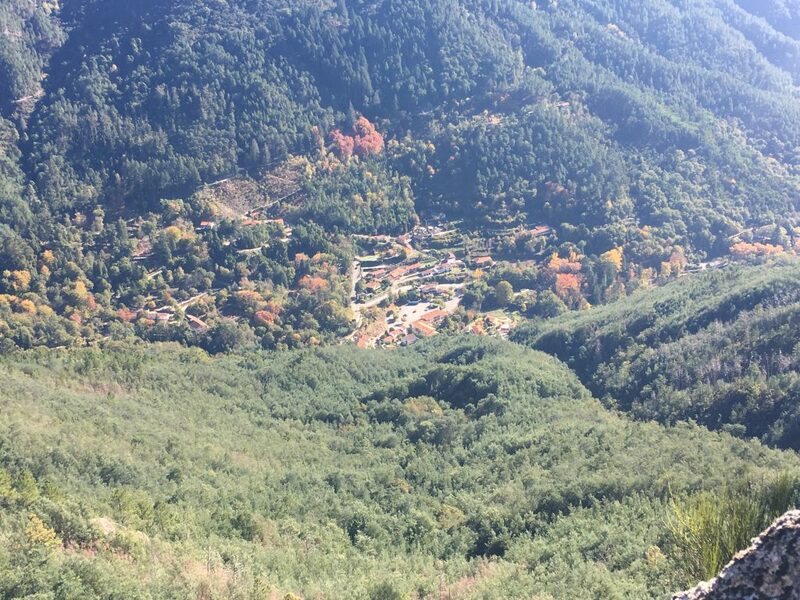 We retraced our uphill bike ride, this time downhill and freewheeling most of the way, the switchbacks were particularly thrilling as we cycled downhill towards what looked like a sheer drop off before turning onto the next downhill. When we got back we were exhausted but the adrenaline was pumping and so we used the energy to set off away from the hills and back down to the coast. I’m still regretting leaving, when will we ever get such a good period of weather for exploring such a wonderful place? We’ll be back one day for at least a couple of weeks to give us plenty of time to explore and enjoy.